I write and perform for adults and children. If you have an event that requires creative input (business, leisure, community activity), or if you wish to book an entertaining poetry performance on any subject, or learn how to create and write a poem, comedy sketch or play script, please get in touch with your requirements. Several Oxford poets gathered to read their work inspired by El-Salahi's art. 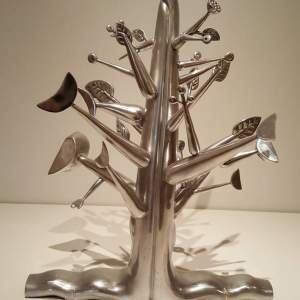 I was attracted to the shapes in the Aluminium Tree sculpture and wrote a piece based on this object. The poems have been added to the exhibition for visitors to read. Lower Ground Floor, Gallery 8 until 2nd September 2018. Ashmolean Museum, Beaumont Street, OX1 4PH. A journey from East to West using poetry and song to tell fascinating Ashmolean-inspired stories. Audience participation welcome. FREE tour, no booking required. 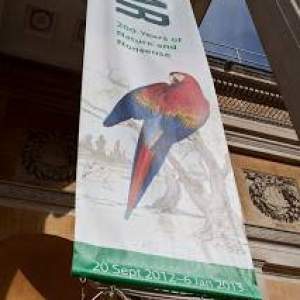 For this event, I used poems from my books: Objects in the Ashmolean, An Art and Poetry Resource, and A Visitor to the Forest, a poem designed for performance. Both books are available in the Ashmolean Museum shop, (also available in Blackwells, Oxford libraries, independent book stores, and online). A journey from East to West using poetry and song to tell fascinating Ashmolean-inspired stories. FREE tour, no booking required. Ashmolean Poetry in the Galleries: The theme is: 'What Lies Beneath' I will be reading my poem inspired by Mark Gertler's painting of Gilbert Cannan and His Mill. March 2017 Completed my third book ~ an Art and Poetry / Performance / Resource. It is a collection of poems, lyrics and script, based on art and objects in the Ashmolean Museum. Poetry in the Galleries of the Ashmolean (now called Ekphrasis Poetry). The theme for the March readings was Light. I used the contrast of light and dark in Bicci di Lorenzo's St Nicholas of Bari Banishing the Storm. My piece is a poem lyric that gives the mermaid a voice. This wonderful art - part of an altar piece - is found in Gallery 42, Early Italian Art, and features in my new book: Objects in the Ashmolean. Lady Nuffield Home ~ A session that included Art, Poetry and Songs. 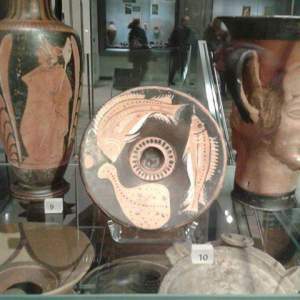 Ashmolean Museum 21st January 2017 ~ Poetry Tours in the Galleries, starts at 2:oo p.m. finishes by 3:00 p.m. 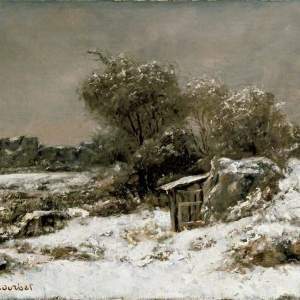 I will be reading a piece based on a Winter Scene by Jean Desire Gustave Courbet. Ekphrasis Poetry Event at the Ashmolean Museum ~ Saturday 19th March 2016 The theme for today is based loosely on the quote by Picasso: 'Art is a Lie That Enables Us to Realise the Truth. 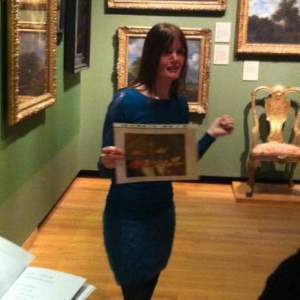 Images show Diana Moore reading her poem inspired by Gilbert Cannan and his Mill and (pictured below) performing a musical poem/lyric based on a Still Life painting with a Lobster and Turkey (Abraham Van Beyeren). The audience of visitors, supporters and poets joined in spontaneously with this humorous work set to well-known operatic piece by Amilcare Ponchielli ~ Dance of the Hours and perhaps better known as the tune to Allan Sherman's 'Hello Mudder Hello Fadder'. 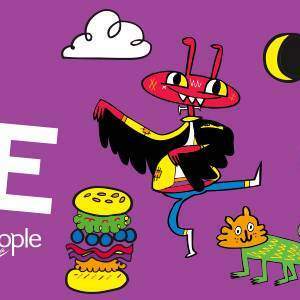 LiveFriday at the Ashmolean ~ 29th January. The theme is Heroes and Villains. A date for your diary. 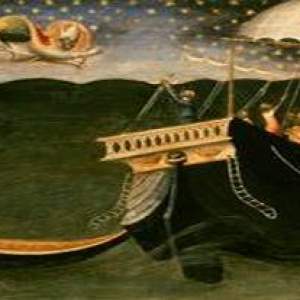 I will be performing a piece based on Bicci di Lorenzo's St Nicholas of Bari Banishing the Storm, in the early Italian art gallery 42. It is one of my poem/lyrics that is part song, part spoken, and in this case, written from the viewpoint of the mermaid. 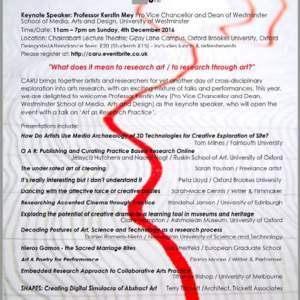 Ashmolean Museum ~ October 24th 2015 Ekphrasis ~ poetry in the museum 2:00 p.m. 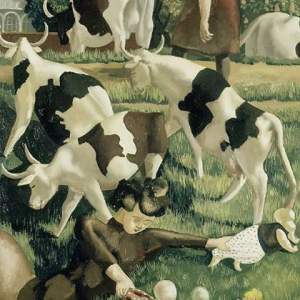 Delighted to say I will be performing a poem based on Stanley Spencer's 'Cows at Cookham'. Modern Art, Level 3. The piece developed into a poem/lyric/script - see additional notes in my journal. 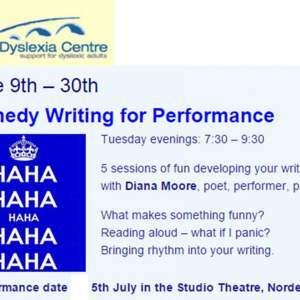 Adult Dyslexia Centre ~ Comedy, Poetry, Writing and Performance Workshops leading to a Theatre production at Norden Farm Centre for the Arts. http://adult-dyslexia-centre.co.uk/ I had some lovely feedback on this production. Here is a shortened version of the testimonial by Centre Manager, Debbie Farnfield (you can read the full version on my journal page). ..."What an achievement - to enable a group of dyslexic adults who have difficulties with words, sequencing and memory to feel confident performing in a theatre to an audience who thoroughly enjoyed the show. 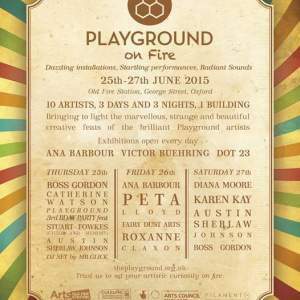 Thank you, Diana, for all your, patience, perseverance and belief that we could 'produce the goods...."
Playground on Fire ~ Arts Festival ~ 25th to 27th June at the Old Fire Station ~ I am delighted to be a part of the Playground on Fire events. I shall be in the Gallery on Saturday 27th June from 3 - 4 p.m. Joining me will be: actor Jon Crowley and soprano Anna Shackleton. Together we will be presenting 'A VISITOR TO THE FOREST'. 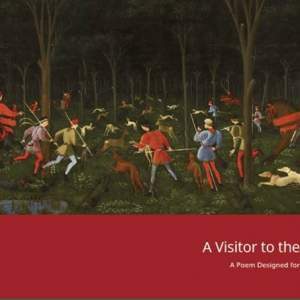 There will be singing and acting/improvising of extracts from this arts-based performance poem inspired by Paolo Uccello's The Hunt in the Forest. Audience participation is invited. All welcome. October / November 2014 Working with graphic designer on images for the next book, a poem designed for performance based on 'The Hunt in the Forest' (pictured). 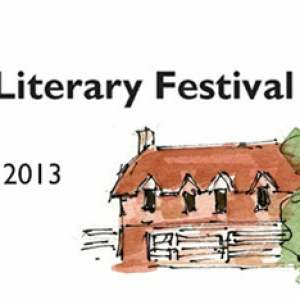 June / July 2014 A busy couple of months which includes: Ashmolean Poetry Tours in the Galleries, an all day school session at Wootton St Peter school, open mic at Blackwell's in Oxford and private poetry readings. May 2014. 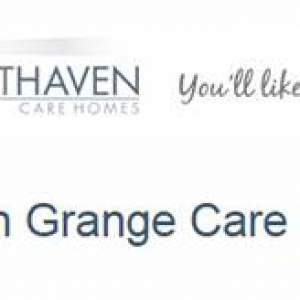 Recent poetry workshops include visits to residential villages and care homes. 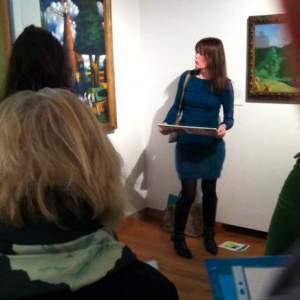 22nd February 2014 Ashmolean Poetry Tours in the Galleries. A contrast now from the recent fab events going on at London's Southbank Centre to the wonderful Ashmolean Museum. My latest poem: 'A Time To Bond....' is based on the The Tallard Madonna ~ Virgin and Child ~ painting by Giorgione. And accessible to both adults and children - this piece, for example, would be suitable for aged 9 years and upwards. Southbank Centre Imagine Scratch Mixer. Feedback: ** "Great!" ** "Very Good Fun" ** Thanks to all who came along to see the work in progress - and it was good to watch some very competent artists at work. 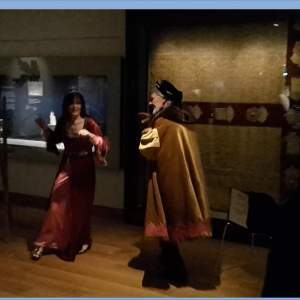 Ashmolean Museum Poetry Tour in the Galleries ~ the next tour is on 25th January 2014. My latest poem 'Two Bream and a Ray' is based on a Fish Plate housed in the Rome Gallery. 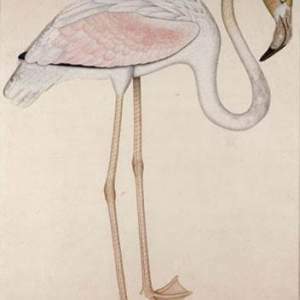 The Greater Flamingo slipped out of his aviary (Jameel Centre) today for a performance of 'Flamingo Calypso'. Thanks to the visitors who came along specially (on a busy Christmas shopping day), and who were great sports and joined in with the 'song and dance'. 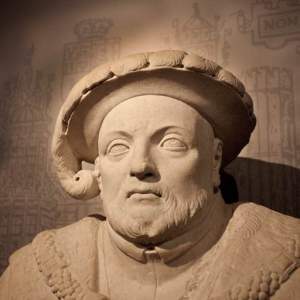 'One of the major driving forces of Henry VIII's life was the desire for a son to succeed him'. 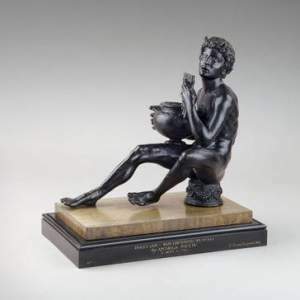 Pan Listening to Echo ~ This beautiful bronze inkstand is situated in the Italian Renaissance Gallery 43' 'The classical god of the woods and fields is here shown in near-human form, with only his small horns, sharp pointed ears and tuft of tail betraying his true nature...' I experimented with an echo poem and based it on the Greek mythology of Pan's vain love for Echo. 11th May 2013 Ashmolean Museum Poetry Tour in the Galleries. 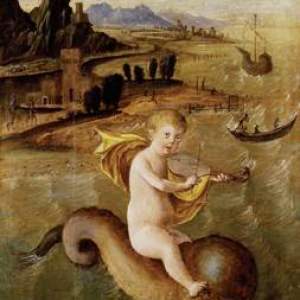 'I've Got The Silver-Finned Blues' This poem is in two parts and based on two objects: 1) Early Italian art Gallery ~ Bicci di Lorenzo St Nicholas of Bari Banishing A Storm and 2) Western Art Gallery, Parcel-Gilt Silver Ship in the Michael Wellby Collection. I decided to give the mermaid a voice; it turned into a song lyric. 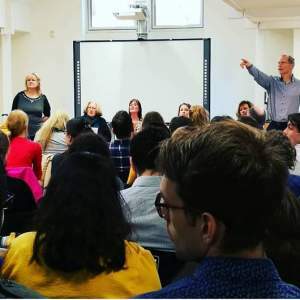 Behind the scenes there were meetings with Education Officers to devise the two events which comprised of 'Nutty but nice things to see make and do' and 'Crafts, song and story fun'. I created a new birthday song and birthday dance especially for the occasion. We had good feedback on the "very well thought out programme, which no doubt Edward Lear would have enjoyed hugely" And that is how I felt, that I was honouring Edward Lear. 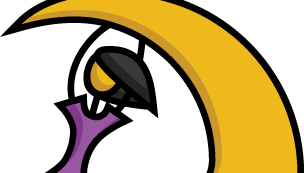 I drew pictures, wrote lots of new poems and created new nonsense creatures such as the curious sea creatures known as Oscillating Octobells and Quivering Quaverfish (see images). Drawings and poetry were inspired (in part) by several of Edward Lear's alphabets. 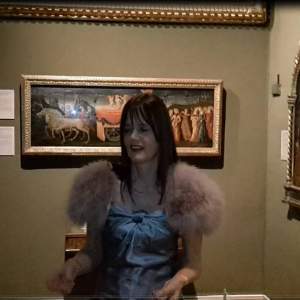 As well as writing and performing for children and families, I wrote and performed new nonsense poetry in response to the 'Happy Birthday Edward Lear' exhibition. 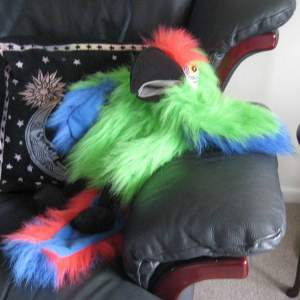 Pictured (below on the right) is 'Polly P-solly' the parrot who assisted me with a humorous take on pronouncing the word Psittacidae (Psittacidae is the Latin word for parrot family). Polly is taking a well-earned rest from squawking. I have an educational, child friendly version of my poem Psittacidae for use in schools. It is just as good for adults who enjoy a fun presentation of words and images.